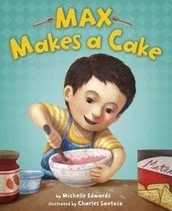 Max can't wait to make a special Passover surprise birthday cake for his mom. Only his baby sister, Trudy, keeps getting in the way of his dad helping him. He tries to be patient while his dad gets Trudy to bed. He waits and waits but he wants to "hurry, hurry, hurry." When he realizes they had a mix for the cake but not for the frosting, he rushes to the refrigerator to see what he can find. With all of the ingredients for a cake and frosting in hand, Max gets impatient waiting and takes matters into his own hands. What surprise will his dad find when he finally returns? While Max's resourcefulness and charm will warm the reader's heart, the abrupt change from the story of the Passover to Max making a cake may leave a feeling of confusion. A cute story intended for a large audience but may miss the mark for those not familiar with the Jewish traditions.